Ghee ladoo or Nei Urundai is a very popular and a common snack item that most of us love. When it is Diwali time, there is no scarcity for sweets of which this Nei Urundai plays a key role. Among those mixtures and sweets that pop into our home from the neighborhood houses, this Nei Urundai outperforms with its unique taste and aroma. 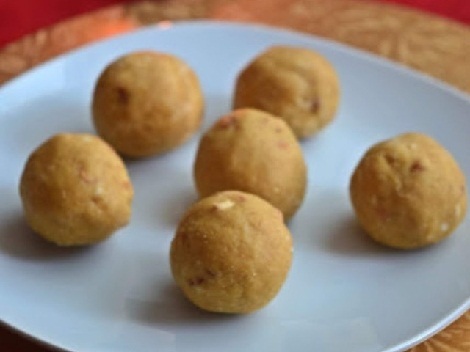 Nei Urundai is a ladoo variety made with rice flour as the primary ingredient. The dish is also called as Pasi Paruppu urundai. Note: this recipe requires preparing your own rice flour than store bought packet flours. On the other hand, if you do not have enough time to make the flour, you can opt for Idiyappam flour to try the recipe. How to make the Rice Flour? Take the raw rice and soak it in water for half an hour. Drain out the water from rice and dry it under shade on a white cloth. Get it finely ground in a mixer jar or at the grinding mill. Make sure that you grind it nice and fine so that you get the real melting texture when had. Once ground, get it sieved using a sieve. Tip: you can opt to grind it in a heavy duty mixer jar instead of a grinding mill if there is no mill in your locale. Take a pan and dry roast the split moong dal. Keep the flame in low to medium and roast until the dal gets crisp and aromatic. Yet again, get the powder sieved. Take a heavy bottomed pan and heat it. Now, add the ground rice flour and lentil powder and start dry roasting it in the pan in low to medium flame. Now switch off the stove and allow this mixture to get cooled down a bit. While still hot and at a bearable temperature so that you can handle it with free hands, start making balls or ladoos. Make ladoos with the entire mix. These ladoos can be stored in air-tight boxes for up to 10 days. So, what are you waiting for? Go on and start making your favorite snack!